Found 39 file extension associations related to Nokia Suite and 29 file formats developed specifically for use with Nokia Suite. 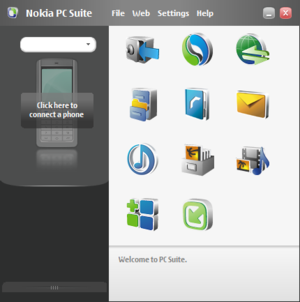 Nokia Suite (also known Nokia PC Suite, Nokia OVI Suite) is a package of Windows-based PC applications developed especially for use with Nokia phones. Depending on your phone model, Nokia Suite lets you edit, synchronize and back up many of your phone's files on a compatible PC through a cable or wireless connection. Fix broken JAR association caused by Nokia PC Suite - Restoring broken JAR functionality with Jarfix. If you need more information please contact the developers of Nokia Suite (Nokia Corporation), or check out their product website.